The Dead Sea area is a world wide unique natural site. The specialty of this site can be attributed to several factors, such as its location 400 meters below sea level and the resulted special biodiversity system due to this location. The Dead Sea is located in the Dead Sea Rift, which is part of a long fissure in the Earth’s surface called the Great Rift Valley. The 6,000 kilometers long Great Rift Valley extends from the Taurus Mountains of Turkey to the Zambezi Valley in southern Africa. The Great Rift Valley formed in Miocene times as a result of the Arabian Plate moving northward and then eastward away from the African Plate. According to geological theory, approximately two million years ago the land between the Rift Valley and the Mediterranean Sea rose to such an extent that the ocean could no longer flood the area. Thus, the long bay became a lake. The first such prehistoric lake was named “Lake Gomorrah” and was a brackish water lake. As the climate turned more arid, Lake Gomorrah shrank and became saltier. In prehistoric time’s great amounts of sediment collected on the floor of Lake Gomorrah. The sediment was heavier than the salt deposits and squeezed the salt deposits upwards into what are now the Lisan Peninsula and Mount Sedom (on the southwest side of the lake). When the floor of the Dead Sea dropped further due to tectonic forces the salt mounts of Lisan and Mount Sedom stayed in place as high cliffs. Presently, the Dead Sea body is composed of two parts, northern and southern, separated by the Lisan Island. The main tributary of the Dead Sea is the Jordan River, which drains into the northern edge. The human history of the Dead Sea goes all the way back to remote antiquity. Just north of the Dead Sea is Jericho, the oldest continually occupied town in the world. Somewhere, perhaps on the Dead Sea’s southeast shore, are the cities mentioned in the Book of Genesis which were destroyed in the times of Abraham: Sodom and Gomorra. King Herod the Great built/re-built several fortresses and palaces on the Western Bank of the Dead Sea. The most famous was Masada, where, in 66-70 AD, a small group of rebellious Jewish zealots held out against the might of the Roman Legion. The Greeks knew the Dead Sea as “Lake Asphaltites”, due to the naturally surfacing asphalt. Aristotle wrote about the remarkable waters. During the Egyptian conquest it is said that Queen Cleopatra obtained exclusive rights to build cosmetic and pharmaceutical factories in the area. Later, the Nabateans discovered the value of bitumen extracted from the Dead Sea needed by the Egyptians for embalming their mummies. The Dead Sea water has the highest salts and mineral content of all seas in the world (the salts and mineral concentration is 29% (on the north – eastern shore). 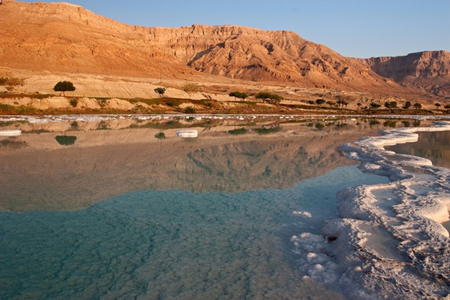 The exact composition of the Dead Sea water varies with season, depth, temperature and so on. The total salinity was 276 g/kg. These results show that w/w% composition of the salt, as anhydrous chlorides, was calcium chloride (CaCl2) 14.4%, potassium chloride (KCl) 4.4%, magnesium chloride (MgCl2) 50.8% and sodium chloride (common salt, NaCl) 30.4%. In comparison, the salt in the water of most oceans and seas is approximately 97% sodium chloride. The concentration of sulfate, SO42–, ions is very low, and the bromide ion, Br– concentration is the highest of all waters on Earth. Because of its unusually high concentration of salt, anyone can easily float in the Dead Sea because of natural buoyancy as a result of the higher density of the water. The Dead Sea climate and unique resources have made it a popular center for several types of therapies such as thalassotherapy and balneotherapy which exploit bathing in Dead Sea water and treatment of black mineral mud. The Dead Sea mud contains salts and mineral as the mud absorbs them from the water itself, it is rich in Magnesium, silicon compounds, it has a mask effect to the skin, helps the stimulation of blood circulation around the joints. The natural healing power of the Dead Sea is utilized to treat skin diseases and joint disorders such as: psoriasis, psoriasis arthiritis, pustular psoriasis of the palms and sole, topic dermatitis (neurodermatitis), ichthyosis vulgaris, mycosis fungidis, lichen planus, localized scleroderma (morphea), uvitis, vitiligo, ankylosing spondylitis (bechterev), and osteoarthiritis (degenerative joint disease).